Among folks in the competition barbecue circuit, I’m well known for my continuing tongue-in-cheek adventures and mis-adventures to cook on smaller and cheaper pits. Whether I’m using a tamale pot on top of a Smokey Joe or using a homemade drum smoker, I like to keep things simple and barebones (pun intended). Before I arrived in America in the 1980’s to attend Texas Tech, I had never seen a Weber grill. I was familiar with satay grills, kebab grills, churrasco, and yakitori grills which I encountered in my travels around the world as a pilot. You may not be aware that much of the world barbecues on simple metal boxes. 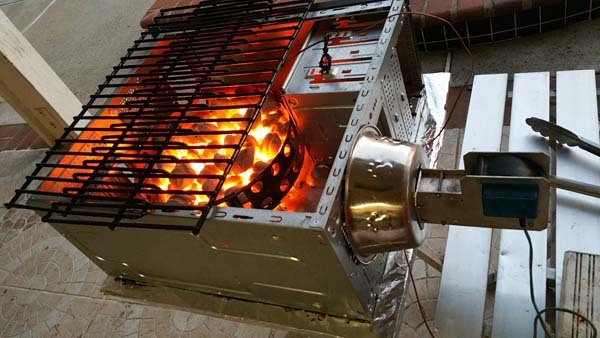 There are many names for this box cooker and a common one is a mangal grill; a Turkish name derived from the Arabic word mangal which means “portable”. I have a satay grill and a yakitori grill so those can also loosely be called mangals. 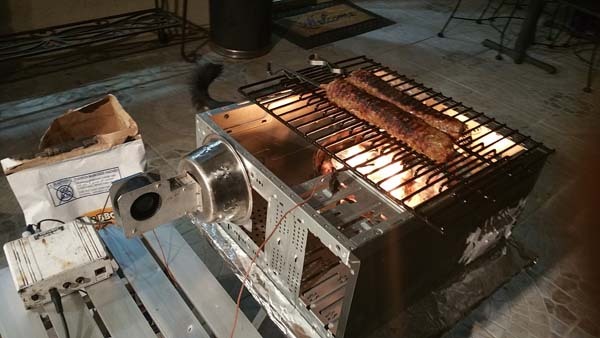 I was looking on the Internet to purchase a mangal to play with and found they range in prices from $100 to $5,000. Since I already had grill grates and flat metal skewers, I thought to myself, “Couldn’t I find a metal box that would do the job?” One of my co-workers, Bob, suggested that I use an old server or PC box. 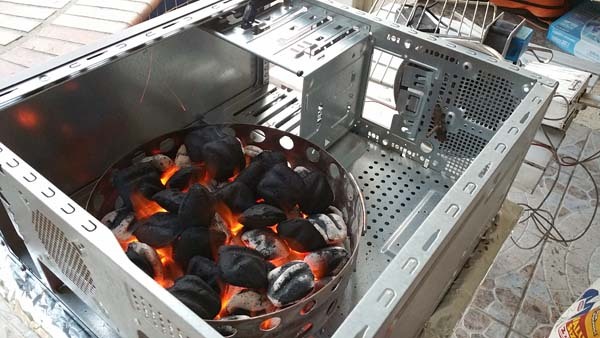 I thought, “What a great idea!” So here is my rendition of a recycled PC grill affectionately nicknamed Revenge of the IT Grill Nerds. It’s important to use an old PC chassis as the new ones have too many parts made of plastic. My co-worker Danny found an old PC box from his friend that was already stripped of all the parts. 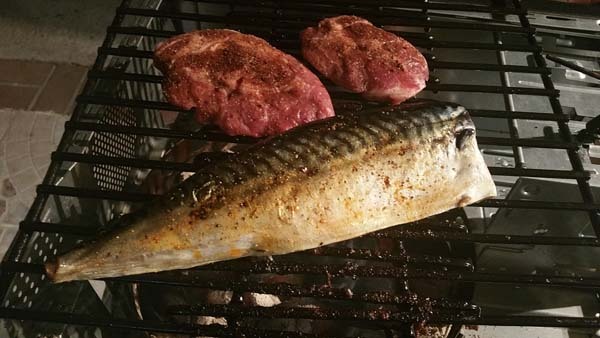 Be advised that we are not cooking on the galvanized zinc coated box but on a steel grill grate built to touch food. So, no food acids could dissolve the zinc into the food. Also, I’m not heating the zinc galvanized steel to welding temperatures that might cause zinc fumes to be an issue. As always, if you do what I did, you do so at your own risk. Remember that everything we do comes with risks. Use common sense. Place the metal box on a heat proof surface like a metal folding table. I covered my metal table with a couple layers of heavy duty foil to make cleanup easy and to cool down the unit. Place four 1-inch metal L-brackets or spacers (I bought mine from Home Depot) at the bottom of the PC box. 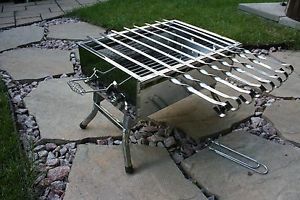 Position a Weber Smokey Joe fire grate onto the spacers so the fire grate rests 1 inch above the base of the metal box. 7. 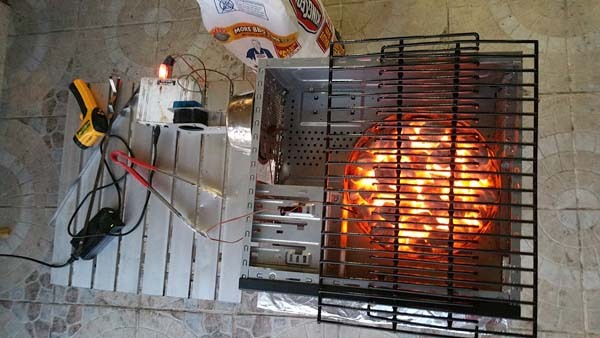 Add a load of lit briquettes and run it hot to get rid of any manufacturing residue. 8. I repeated the hot burn twice before I cooked food on it. I used a Stocker automated blower system to help maintain the heat. I got 600F on the hot zone and 250F on the cool zone. This worked well for the kebab, fish, and pork chop I cooked. Check out my super cool dog bowl fan adapter courtesy of David Davenport of Big-I-Que, my student from Hawaii. The fire was around 1,000F which is cool enough to not melt anything. 9. As a caution, be sure you have a sturdy table to hold your PC grill. 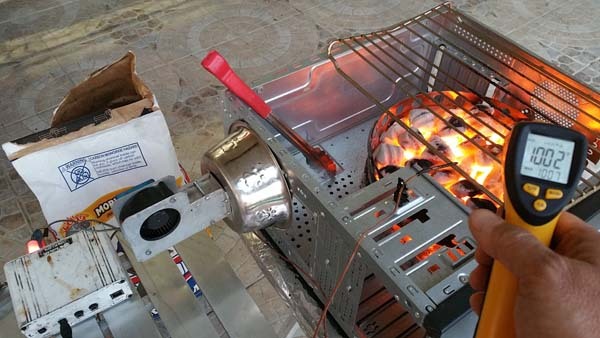 You don’t want your grill to be knocked over. Always have a fire extinguisher close by just in case. If the wind is blowing, be sure your embers don’t set your house or your neighbor’s house on fire. 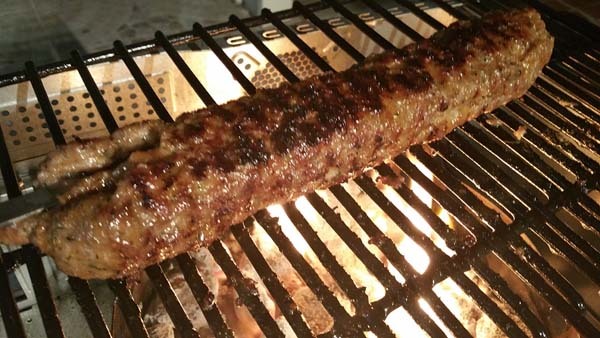 NEVER leave your grill unattended. When you finish, be sure all embers cool down so there is no risk of fire. Be safe always. Back in the day, a BBQ team named Big Blue BBQ was active in the south. 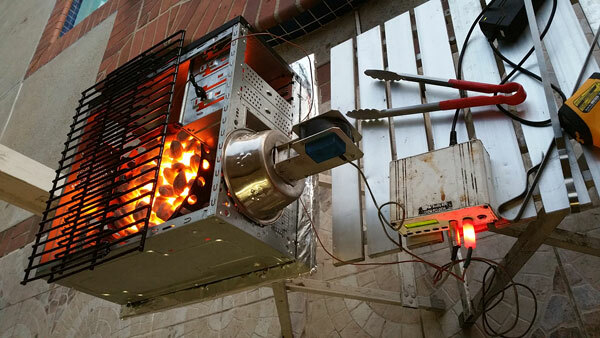 They used an old IBM mainframe chassis as the base for their smoker. I think it was a S/360. Genius! Way to recycle. I love that polished metal look and you took account the possibilities of toxins in the metal if heated up.